Time to take a look at events in the game, both random and the more nefarious and mischievous type. Challenges will be the topic of our next few posts and are the major gameplay element, but in preparation for that we will be going over events today. Let's jump right into the screenshots and break down what we're seeing. "A random, or not so random, event"
Here we have a random event occurring in the future, viewable because our Old One has the "Will over Fate" power which at its lowest level allows the view of future events. This is very handy for getting your agents into position to capitalize on chaos. It gets even more powerful as you awaken, and with the proper prerequisite you can apply as many of the additional effects to it as you like - though they have associated cost in Power, marked by the number of dark Power circles. 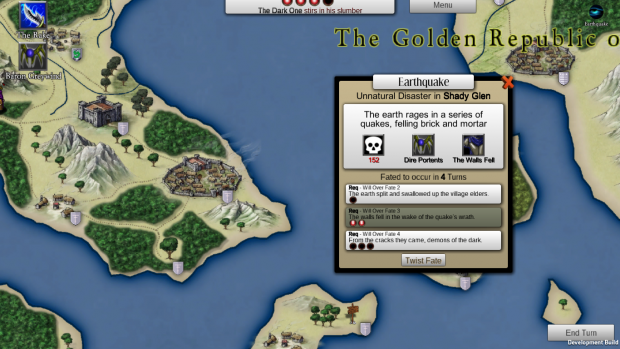 In the event shown above, an earthquake will strike Shady Glen, note that it is considered a Natural Disaster and thus can be affected by certain effects and also does not add to global awareness. Now let's take a look at what happens when you pick one of the added twists of fate. 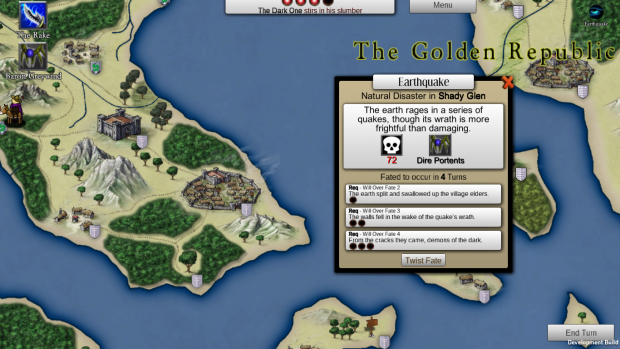 The selected path has upped the death toll, and added an additional effect to the POI, in this case The Walls Fell which halves the defensive value of a POI and requires significant gold and time to fix. Also note the type has changed to Unnatural Disaster, too many of those and people will begin to suspect an Old One who has the Will Over Fate. As usual, mousing over the effect will give you the full information about what happens. Political Events are created by the AI when it wants to make a decision, in general you will not see the majority of these that occur - you will only see them when you have some "Influence" on the Nation or POI making the decision. You can see who is making the decison, what caused it which in this case was a spy caught from Caledon, and what the people consider a popular choice. Below the people's opinion you have the course of actions the AI can pursue, ranging here from trying to soothe over the problem to declaring war. You can see the percentage of influence that supports each of the paths, with the currently winning path highlighted in red. To the right of the courses of action you will see a list of your influence and what it is generated by. Infiltration is a result of several actions on the infiltration challenge, corruption comes from your dark influence over some of the nations members, and The Rake is Welcome at Court in this nation so he contributes influence the closer he is to the nation's capital. Keep in mind that the method of gaining this influence is different depending on the government type. 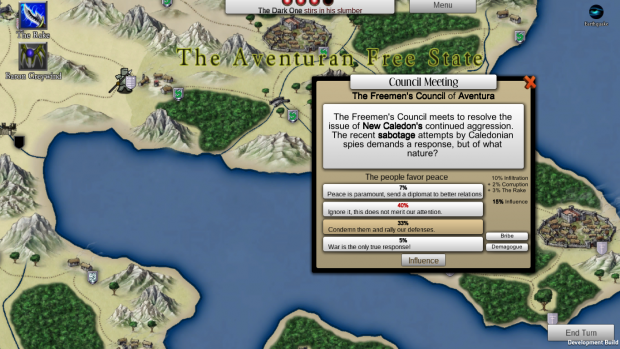 In a republic like Aventura you can gain influence from infiltrating any cities or villages, however in a Monarchy the king himself holds the most power. Underneath your influence you see actions that you may have depending on what Agents are present. Bribery costs you gold but gains you a small boost in corruption, and Demagogue forces up the percentage of the people's popular choice. Using influence, especially on unpopular actions, leaves clues and creates threats for heroes to pursue that might result in your infiltrated agents being outed and hunted down, or even causing the king to be overthrown. "The Peddler using his ability on a nearby adventurer"
The Event Above results from The Peddler using his Wandering Merchant ability on heroes that were active in his POI. This type of event, which we call a conflict event, occurs often as the result of challenges. The affected hero(s) and agent(s) are shown on either side so you can quickly reference their abilities, and the effect is displayed based on which selection you make from the options below. Here the peddler is going to sell a cursed item to a hero, which is always a blast. 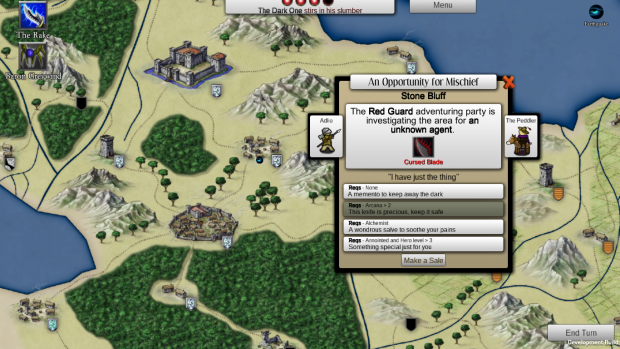 The selected action requires he have Arcana > 2, which is relatively easy to obtain though the Peddler starts with 0. The cursed blade makes the hero more paranoid and bloodthirsty, and at low will the hero may turn berserk on his friends. Like most actions, this will raise the Peddler's fame slightly, but he gains fame at a slower rate than most Agents so it isn't as great a concern, but if his cursed items are consumed or the curse undone, a clue about his identity is dropped which may reveal people to hunt suspicious merchants. That's it for this week, I hope you've gained even more knowledge of That which Sleeps and see how we're trying to meld theme into a traditional Turn Based Strategy paradigm. If you like this game and want to see it through to completion, please join our mailing list which will send out alerts when we go on Greenlight and Kickstarter (for art assets).